Like I read somewhere, Tamarine can be best described as a book you can judge by its cover! Stylish and sophisticated with an entralling bar area of bamboo and glass this restaurant makes an impression the moment you enter. Waiters in Prada black and dining rooms seperated by heavy black curtains add to its trendy elegance. 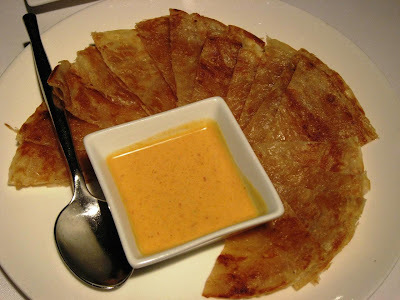 This restaurant run by Anne Le and executive chef Tammy Huynh, is contemporary reinvention of modern Vietnam cuisine. 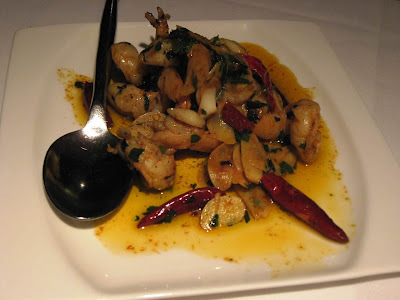 I have already reviewed their other classy restuarant in San Francisco, Bong Su. I was already looking forward to another great experience. 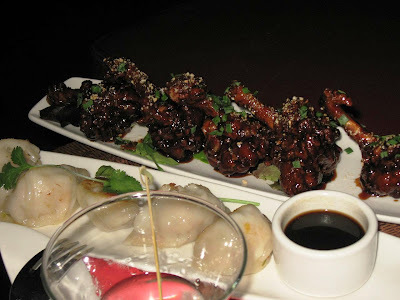 We ordered some starters including the Tamarine Spiced Wings and the Spring Rolls. The spiced wings were served with a pineapple-jicama slaw and a gingery sauce. Wasn't particularly great. 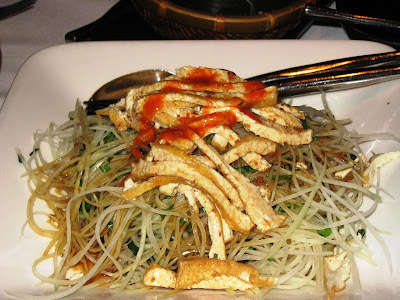 The spring rolls - we had ordered a vegetarian version - were filled with beansprouts and mint with a hoisin chilli sauce. It was ok-ok, nothing to rave about. The Clay Pot Cod was thankfully much better. 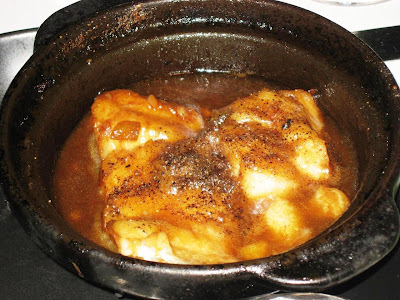 The Alaskan black cod was carmelized in onion, black pepper, garlic and molasses and was extremely tasty. 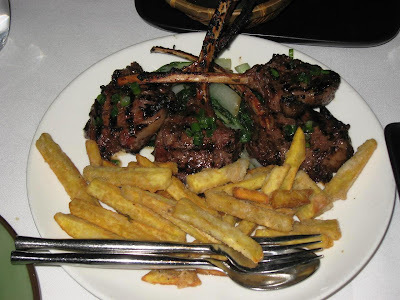 The Hoisin Lamb Chops were very good too. The dish was made in hoisin, garlic and rosemary grilled chops served with baby bok choy and sweet potato fries. Nicely done and the sweet potato fries were an interesting touch. 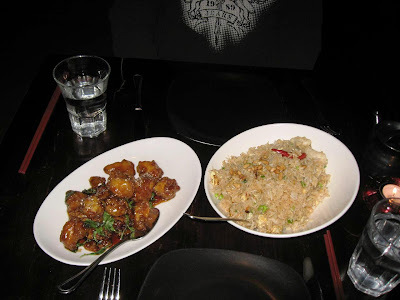 I have to also mention the Empress Fried Rice which you have to order every time! Sticky rice, garlic, leeks, ginger and eggs go into making this fabulous dish. It is served with a sweet soy drizzle. There were a few other dishes on the table, some of which I didn't sample. Others not particularly remarkable. The Chili-Lime Aubergine is grilled Japanese eggplant finished with onion oil, scallions and a chili-lime fish sauce. 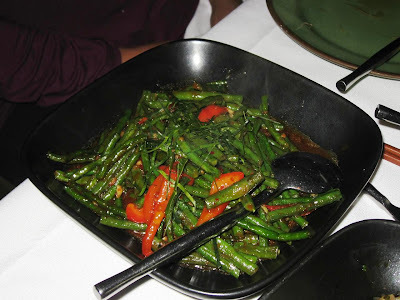 The Curried Long Beans is beans sautéed in red chili, kaffir lime leaves and onions. The Sake Mushrooms have Shiitake mushrooms, garlic & sugar snap peas wok fired in an oyster-sake sauce. Overall, I would say the food is good if you select carefully. The decor, ambiance and service cannot be flawed. What I enjoyed most was the company tonight: my friends, Mythili and Shekar - thank you for a wonderful evening! PS: I just now realized Bong Su in San Francisco closed earlier this year. Sad. 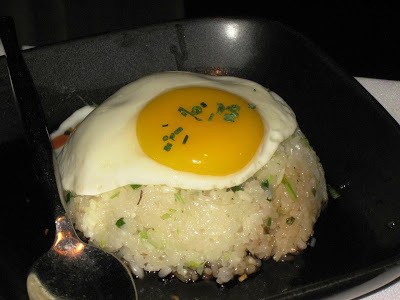 The rice with egg reminds me of a dish I ate in Malaysia. 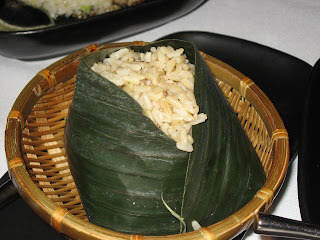 It was fried rice with an omelette filled with prawns. Don't remember the name but it was delicious.